A new hotel was unveiled in Malta with a ribbon cutting. 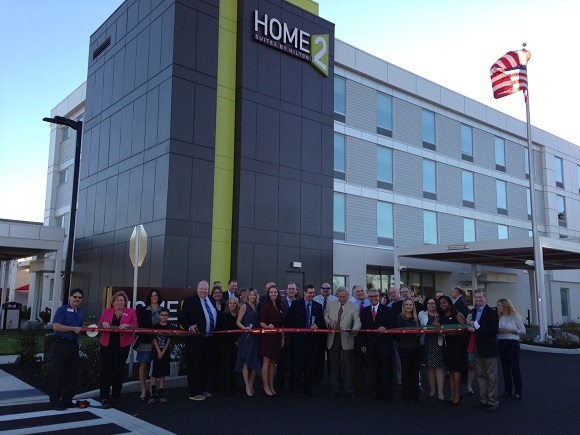 Home 2 Suites by Hilton an extended stay, pet friendly hotel hosted a grand opening on Oct 19, 2016. The hotel is located at 103 Saratoga Village Blvd in Malta. Their spacious suites offering a well-equipped kitchen complete with a full-size refrigerator, dishes, microwave and flatware. Each suite features movable furniture, perfect to redesign the room to fit your business and living needs. Enjoy the open and airy layout of your suite, which features furnishings made from recycled materials. Unwind in the heated indoor pool or relax on the outdoor patio. Wake up to a free breakfast. A modern business center and free WiFi. Manage your time effectively at their Spin2 Cycle Center—Laundry and Fitness Facility. Pictured center is Al Stephenson and Shelbie Northup of Veeder Hospitality, Lauren Archambault, General Manager; Don Greene, owner and Assemblyman James Tedisco surrounded by family, friends and customers joining Chamber Ambassador Garry Packer of Viridian Energy and members of The Chamber of Southern Saratoga County and the Saratoga Chamber.